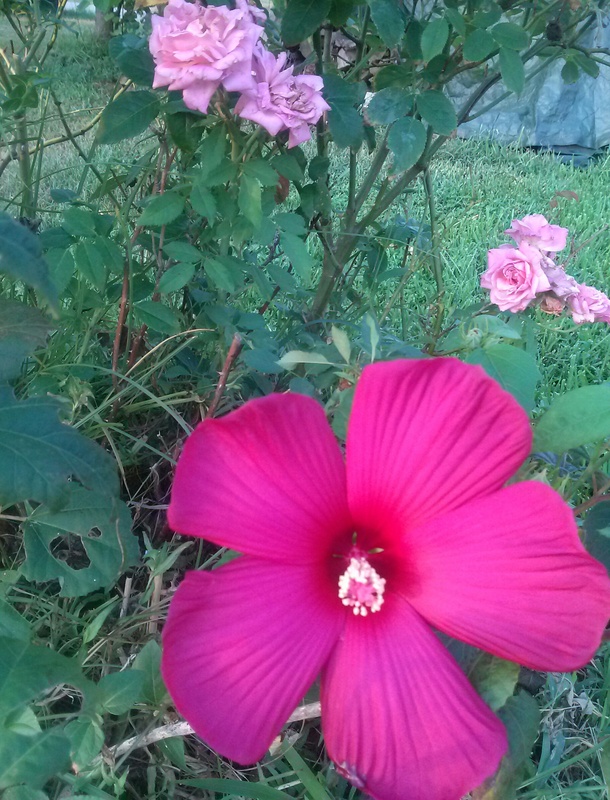 Bloom sizes; Rose Mallow (6 inch diameter), Belinda’s dream (2 to 2 1/2 inches in diameter); both plants are currently producing blooms. Belinda’s Dream produces blooms from Spring through Fall; the largest and most abundant blooms are in the spring, reduced number and size throughout summer, and a few more larger blooms in the Fall. The Rose Mallow begins blooming when the temperatures are consistently above 90 degrees and continues blooming through Summer and into the Fall; the largest blooms appear early in the blooming period (8 to 8 1/2 inches in diameter) and consistently reduce in size over the course of the summer (smallest about 4 inches in diameter). The Rose Mallow blooms last a single day; they unfurl in the morning, are fully open by mid afternoon then shrivel and drop in the evening. Belinda’s Dream blooms generally unfurl over the course of one day (by mid afternoon) and then slowly deteriorate over the course of 3 to 5 days (longer flower life in cooler weather). Both plants have similar water needs and do well together on the same watering schedule (once a week by dripper hose). I use Miracle Grow fertilizer (blue crystals) to support vegetative (green) growth after the last frost. In rainy Spring seasons, I’ll use Miracle grow for roses (to encourage blooming) on both plants about a month to six weeks after the last frost. Trim all roses on Valentine’s day (or the nearest Saturday following Valentine’s day–time permitting); Cut back all stems smaller than a pencil (average sized wooden pencil with lead) and cut just above a leaf bud location. The rose mallow is self-sufficient, no trimming needed unless it becomes unruly (I don’t trim it because it will freeze down to the ground over winter).